Here's one for the Architectural Challenge... only it's a stretch to call it architecture! This carved tree trunk in is Iola, Wisconsin. 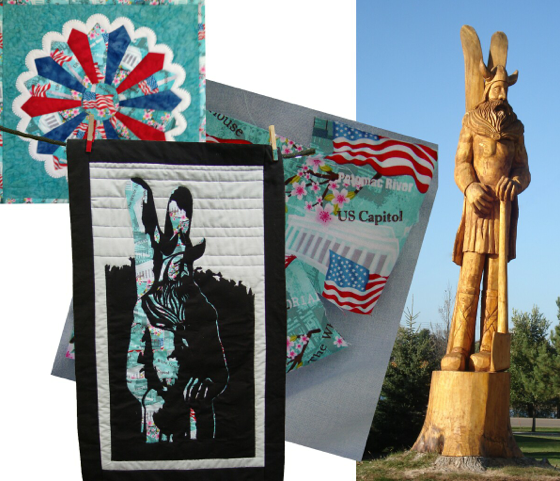 As part of the upcoming quilt show, guild members were challenged to use this"unusual" turquoise-patriotic-architectural-text-cherryblossom fabric (shown in the center background of this photo) in a quilting creation. I decided to tackle the pole. A friend did a Dresden Plate. Most of the projects are in hiding and we won't see them till the show opens. My Victoria-made-fabric is the challenge fabric cut and reassembled to tone down the red flag stripes and for use as the sunny part of the sculpture. You did an amazing job! It's wonderful!